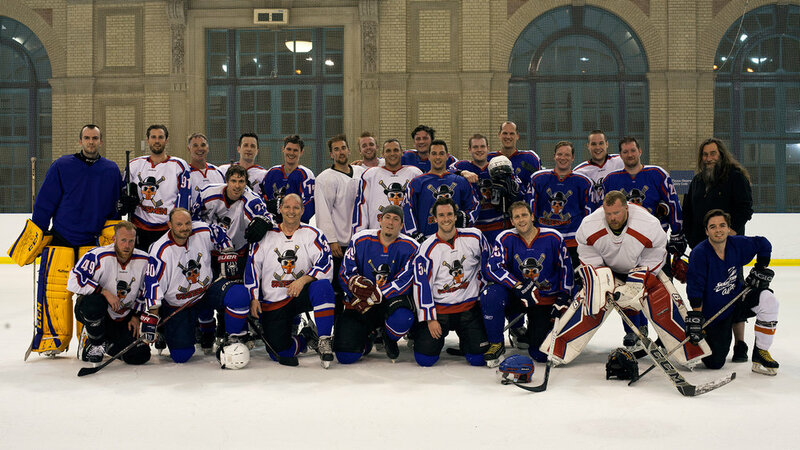 We are non-checking EIHA registered recreational ice hockey team based at Alexandra Palace in North London, England. Our general ethos is to have fun, both on and off the ice. We aim to create an atmosphere in which members can enjoy a reasonable standard of hockey and improve their skills, while maintaining an environment that is fun and inclusive. Each year we also arrange trips to tournaments, both domestic and abroad. Some say that we're a social club that happens to play ice hockey; we like to meet up for beer, wings, hockey and beer, including (but not limited to) a friendly round of pitch and putt, beer festivals, festive skating through London (Santa Skate) and an annual Summer barbeque, just to bridge the gap between seasons. We train every Thursday evening from 8pm - 9pm throughout the year, with the exception of some holidays and during August for a Summer break. Training usually consists of a brief warm-up followed by an intra-squad scrimmage. In addition to training, we routinely schedule matches against teams of similar skill-level from in and around London. Please note that there is an EIHA insurance condition stating that NO unregistered players are allowed to get on the ice without prior consent from the team management. For this reason, please contact us before turning up at the rink. However if you're just dropping by, then feel free to come and watch and talk to the team. We're always on the lookout for new players to join the team, so if you're interested then feel free to get in touch. We have players ranging from those that have played league at a young age to those that have only ever played rec and learned to play hockey with the Statesmen. At the team's current state we do, however, insist that you are able to play to an intermediate rec hockey standard. All players must also be age 18 and over. We ask new players to join us for a commitment-free four-week trial period to see if we’re a good fit for one another. If so, then you'll have to register with EIHA, our governing body. All of our games, training and inter-team communication is handled with a mobile app TeamSnap, so it's easy to keep organised. If you're interested, please email our chairman Benjamin Hall. To arrange a game or tournament with us, home or away, please send an email to our fixtures manager Mark Freitag and we'll see what we can do. We're a long established club in London, having played recreational hockey since 1989. The founding players were originally comprised of employees of British Telecom, and decided to choose the 'Westminster' area of London to take their name. As it happened, the latest home phone model at that time was called the 'Statesman'. So there you go. Since then the team has grown and changed over the years, and now consists of players from the UK, Canada, America, Sweden, Finland, Czech Republic, Russia and Denmark, and probably some others that we're not too sure about. We first started playing in the Sobell Centre where, between 1992 - 1997 we had very few games. Since then the team was reformed and evolved into its current state, only now calling Alexandra Palace our home. Over the years we have taken part in tournaments abroad including trips to Holland, Belgium, Boston, New York, Detroit, Las Vegas, Austria, Germany and Slovakia.